Well - no sooner did L-kun get back to Adelaide, have his 4th birthday, and then have another birthday (he insisted on having a second the following day) - then he was ready for the next big adventure. Kindergarten! Actually, he's only on pre-entry now, which equates to 1x2 hour session per week, but for us it's a big transition. You see, T-chan's been looking after L-kun pretty well everyday for the last four years - and been doing a good job (under sometimes difficult circumstances, as I'm sure every stay-at-home mum knows all to well)... so this is just a big a day for her as it is for L-kun. Actually, even I think when I see some of these photos how he looks older than just 4 years old... and it makes me realise just how quickly he'll go from small child to big child to young man in the blink of an eye. And of course, he's sporting some international fashion... his backpack comes from Skip Hop, a US-based company. Even though these were bought in Japan, you can also now purchase them locally in Australia (David Jones department store stocks them). The dog one was a favourite of L-kun. Actually, we're starting to worry about the things that he wears and brings with him - something we didn't need to before. The important thing is food-wise: only water, no processed foods, and no nuts. Thankfully at least, we know that L-kun doesn't have a nut allergy... something that is a real concern these days (but I'm sure was more or less unheard of in my parents day). We didn't take any photo's at the Kindy (nowadays parents get a little worried about that sort of thing), but when T-chan met L-kun at the end he was all smiles and the first thing he said was "tanoshikatta", I had fun. In fact he was bubbling with excitement all day, and was telling Daddy about the songs they sang and the dance they did. Apparently he was very chatty - though we don't know if he was speaking much Japanese or not. His Japanese was fantastic coming back from Japan, but his English had definitely degraded noticeably...however in the last week it's picked up again quickly. Children are definitely like sponges at that age... but that also means that now is the time we'll start to see his behaviour dictated more and more by his peers, and less and less by us. Our little man is growing up. Well, this is it. The last post. Now I'm sure that you're all wondering .... why so many pictures? Well, the first reason is that I took a ####load of pictures. The second reason is that unlike my normal photos, I've been working pretty hard to clean these up... Photoshop has been working overtime.. something I might post about later. The third, and perhaps best reason (if they weren't good enough) is that whilst T-chan and L-kun have been away, I haven't really done much to write about. Stayed home, did lots of work, browsed lots of internet, had a few red-wines, and basically been very quiet. But I digress. This post is really about the last big thing... the after-party-party. T-chan's parents had gone home (it's sort of tradition that the parents don't attend, to allow the young-un's some fun). They also took L-kun home as well... which meant T-chan and I could have our first night out together in a long time. Of course, when I say night out, I don't mean to suggest a late night. We, I hate to say it, were bushed. Anyhow - we arrived fashioably late after having afternoon tea with S-chan's family (reads: lots of ice-cream for our brilliant young ring-bearer, L-kun, and coffees for the rest of us). By the time we arrived, the party had already begun in earnest. Now whilst there had been some videos before hand, and lots of photo montages (I can't help but think Team America here... but that's another story).... they brought out the real videos of family interviews. And they were fantastic (if I get hold of them, I will put them up).... I have to say, once again, Otousan was the star of the show... he's becoming quite the celebrity. The other aspect of the night was the "question-and-answer"... this was the point where the husband and wife would have to ask a series of questions. Now... let's just say that as H-kun and S-chan had been at working at the same company for perhaps over 10 years together, there were a lot of questions concerning when they started going out together.... come'on... you can tell us. Indeed - very cutting questions, that left the couple a little lost for words. Now I know the answer, but that, as they say in the classics, would be telling.... so let's just say that they gave an answer. Ok... let's just leave it there... this is a no-adult-content blog after all (and we have to leave something to your imagination). Let's fast forward to the after-shot, where H-kun is being very reflective of the occasion... and thinking seriously about the institution of marriage... and all sorts of serious things. And S-chan seemed to be enjoy Aluminium-man's finer points a little too much.... hmmm... either that, or it could have been those suspender stockings (let's leave it there shall we). The party was a great success, and there was lots of great food and drink to fill to the brim each and every one of the many guests... and it should be said that this party was quite a bit different to the formal reception that we had before. There were a lot more people, and the mood was quite a bit more raucous. It was a time to let the hair down, and also a time to say thank-you to all the well-wishers.... but above all, it was a time to enjoy and celebrate the marriage of these two wonderful people. The recent time may have been a hard one for all people in Japan, following the horrible March 11th earthquake, yet that wasn't on assembled people's minds tonight. It was a happy, joyous time, and one that shows that love, like life and the flow of time, heals wounds and grounds us in the here-and-now in the prospect of a future. At this difficult time, two lives have come together, to share each other's happy times, as well as sad times. And we were so very happy that we could share it with them! And what a party it was...Actually, after this, there was even another party for their closest friends.... the after-after-party party. Unfortunately, I have no photos to share of that... but my hat goes off to them. They really know how to get married! 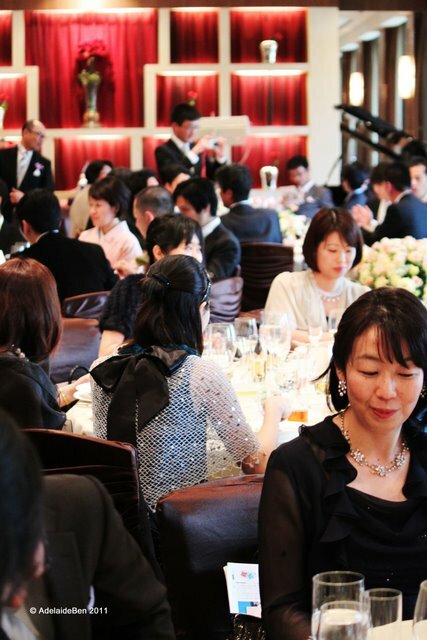 A Tokyo Wedding... Pt 7 Like a Breath of Fresh Air. The penultimate post... and this was a little bit different. The weather had cleared up - enough for us to venture outside with the family and close friends for another series of photos. And to enjoy the gardens of the Hotel New Otani. The skies may be a little grey - but they say that makes for perfect photography (ok... that most probably matters if you know what your doing in the first place). Actually, we didn't get to see much of the gardens - although L-kun was happy to explore (you can just make him out above). The gardens are quite well appreciated, and always draws a crowd on weekends - so finding a nice spot and waiting for people not to be overtly in frame was difficult. It's a good thing that H-kun and S-chan had already had their formal photos done in the garden prior to the day.... when there were less people and better weather. I quite like this shot - reminds me of some 70's tv drama photo... they're the Avenging Couple, fighting crime on the streets and in the chapels. I'd watch that show. S-chan's doing very well to keep herself going after a very long day (and it's only half finished). I don't know how they did it... but I'm sure they were looking forward to a break. And H-kun looked on with sweet love in his eyes... I wonder what he was thinking of? Most probably having a good sleep. Weddings are always so exhausting... but so exciting too. Well - that's a short post... to be honest, I was hoping to have taken more photos outside, but the problem with the Hotel New Otani is that they run multiple weddings simultaneously, and they allocate patches of fenced off garden for the couples... but one of those spots was directly in-front of ours, so for about 15 mins, all you could see in the background were tens of people milling around another wedding couple. Actually - as T-chan and her parents had gone off to get out of their formal clothes, I suddenly realised that I didn't know where they were, or when they were going to be coming down. All I knew was to meet them at the front lobby. about 40mins later... they finally arrived (I'm sure the hotel staff were wondering who the strange gaijin was with the camera standing around the lobby). So - one more post to go... whew... this stuff is hard work, for you and me. After a short break to allow some "changes" to occur for the bride and groom, the reception goes into a funny intermission period - a good time to eat, and catch up on some drinks. 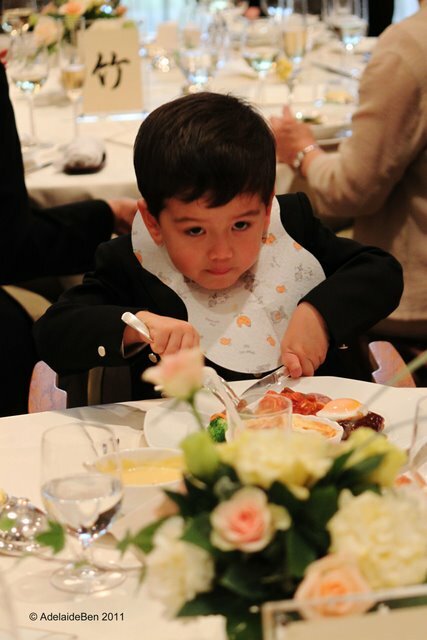 Speaking of which, it's sort of customary for the parents to go from table to table offering each of the guests a drink. Let's just say there's always a staff member around with a top-up bottle if required.Of course, most of the guests are from Tokyo or S-chan's home which is just outside of Tokyo... so there's lots of greeting for the first time. For Okaasan and Otousan, this is a chance to catch up on school and business colleagues of their son that they wouldn't have seen in a long while. Some of these have also traveled a long way. They have a close knit family, and Okaasan and Otousan are well known back in Sapporo...and were rapidly becoming well known here in Tokyo. Of course, it's a hard time as well... and exhausting work. That a lot of hand-shaking, pouring, bowing and smiling... it's a service done with the heart, but also one that will wear out parents very quickly. And most probably about now, Okaasan is thinking that it's a good thing that she only had two children and their both thankfully taken care of... a holiday is due! And S-chan's family were also making the rounds... and of course, each person receives a visit from both families. Of course, Japanese events are filled with alcohol (for good or bad). After all, today is also an opportunity for friends and family to let their hair down a little bit. Having experienced my own Japanese reception (actually - oddly conducted 5 months before the wedding!) I know how hard these greetings and official duties can be. So my hat goes off to the parents who did a truly excellent job. Of course not everyone was getting stuck into the vino. 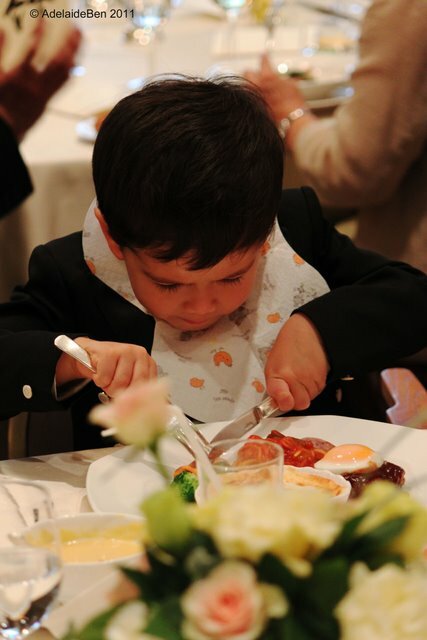 Some people were trying their first experience at a fully knife and fork set. He's such a natural. And the hotel made up a special dinner just for L-kun. You know, I sometimes wish I could wear a bib to go out. Looks quite stylish and, for some of us, it might help avoid those accidental spillages. Then again... sometimes things aren't as easy as they first appear. Ganbatte L-kun! And sometimes... it all just seems like some kind of bizarre torture invented by a sadistic adult to torment and embarrass young boys... Someone should really have a look at these silly things, they must be broken! When not eating at such events, a parent's got to have a goody bag handy... such that there's always something to keep a young boy interested (and quiet?). L-kun loves puzzle books and it'll keep him occupied for hours. Of course it's a little old school... I guess nowadays children have their own iPads (he scoffs derisively, pondering what life would be like if he had his own iPad).